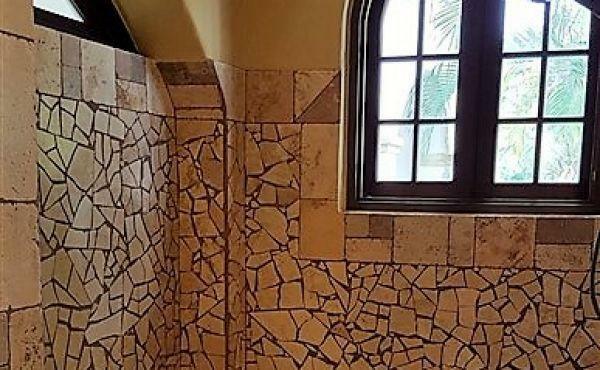 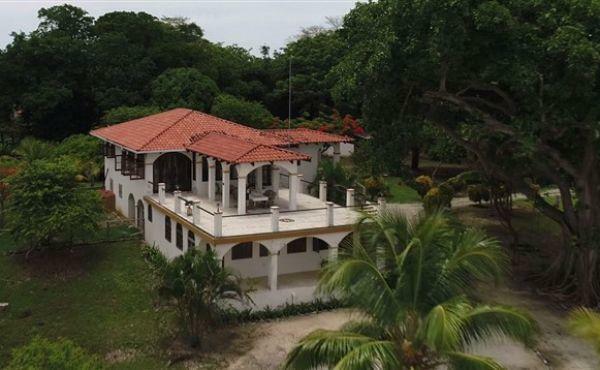 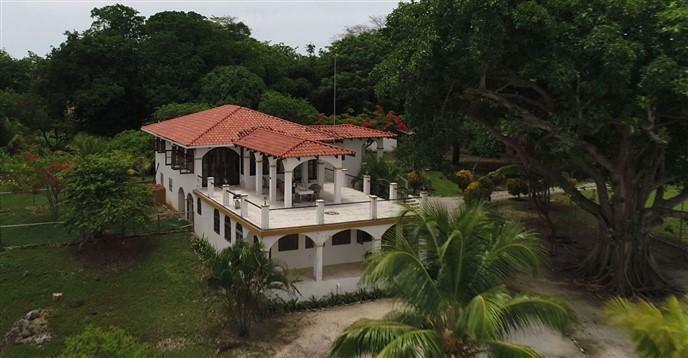 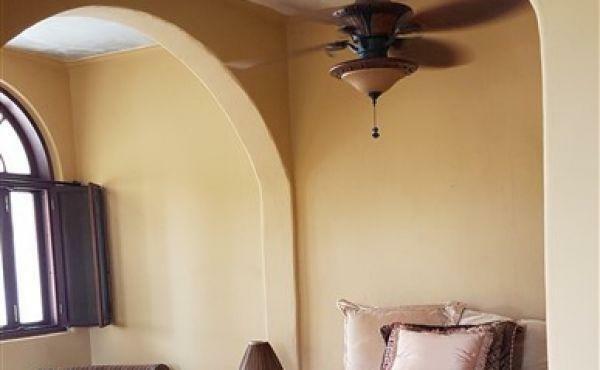 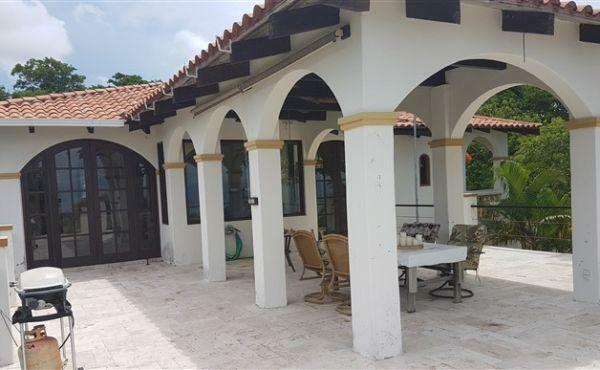 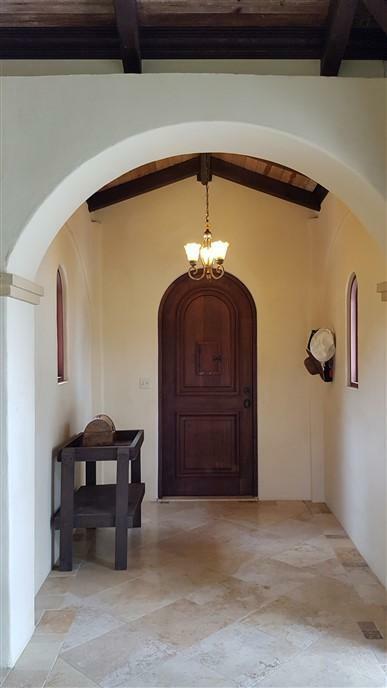 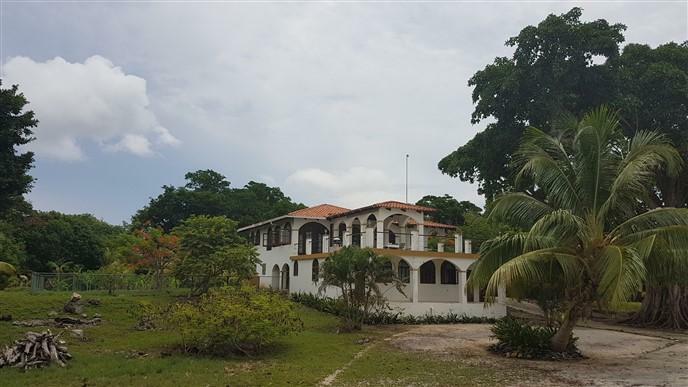 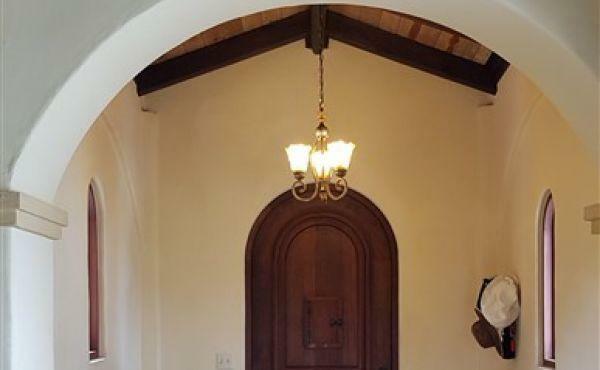 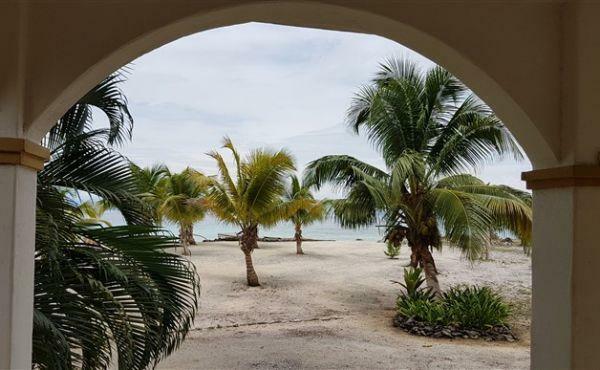 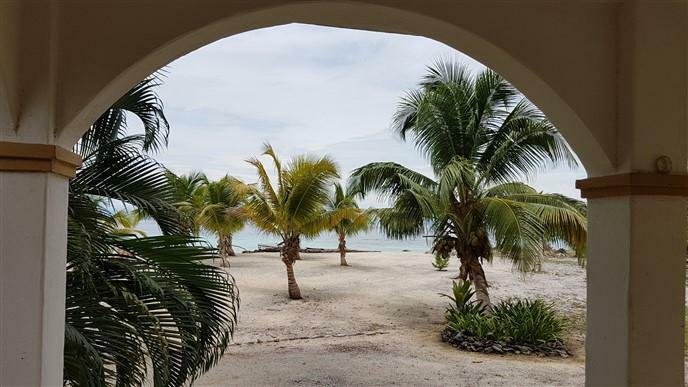 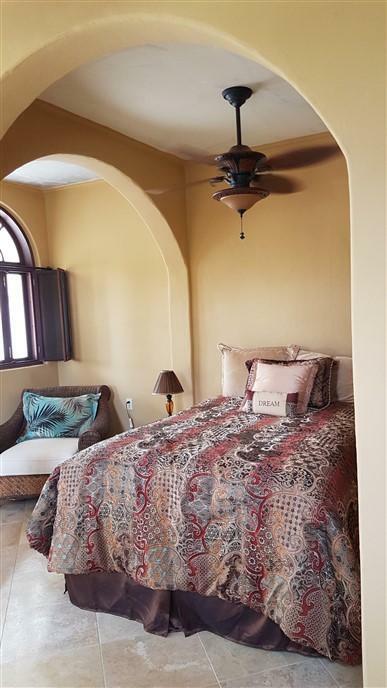 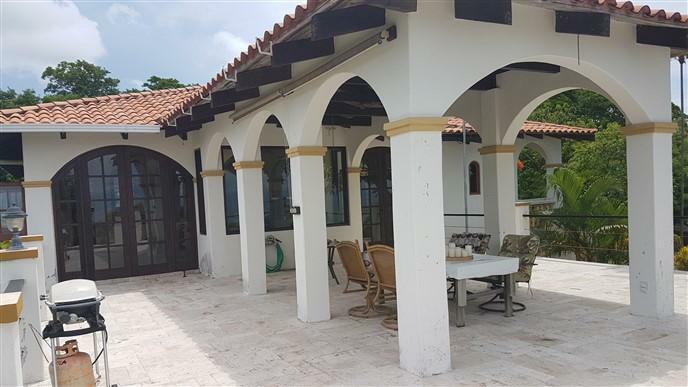 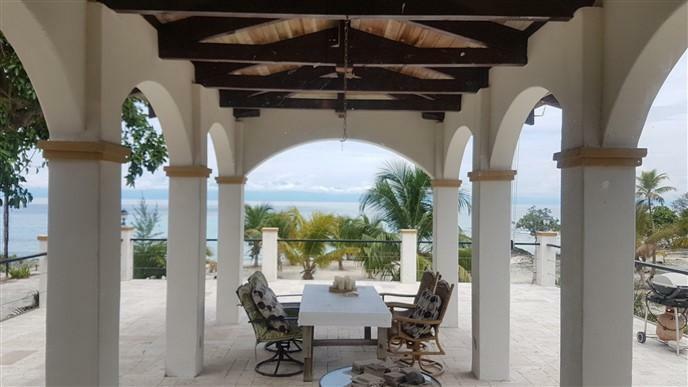 Los Arcos is a stunning home featuring Honduran Spanish clay roof tiles, with custom decorative arches on the open deck area facing the sea that continues with the arched windows of the house. 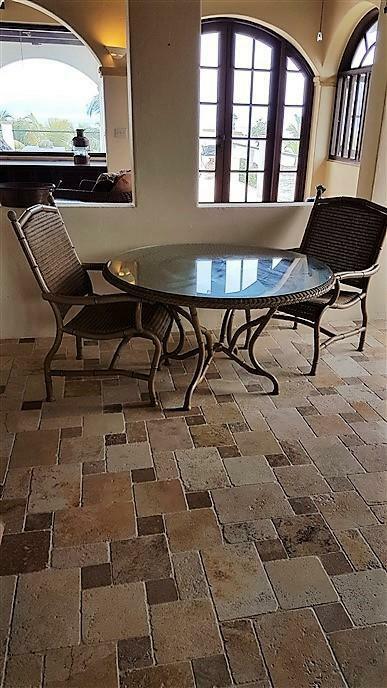 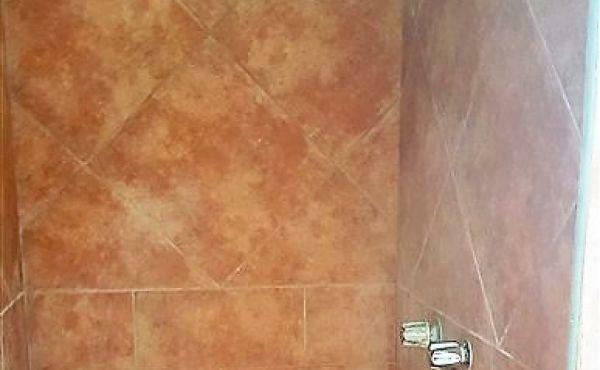 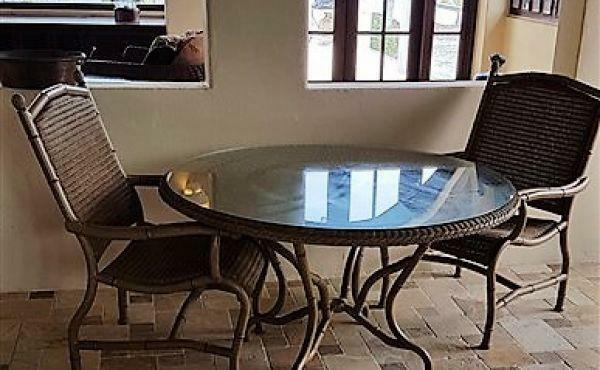 All living and patio areas have Honduran Travertine stone floor tiles, providing unmatched durability and beauty. The architectural style provides beautifully framed views of the sea from both the indoor and outdoor living area. 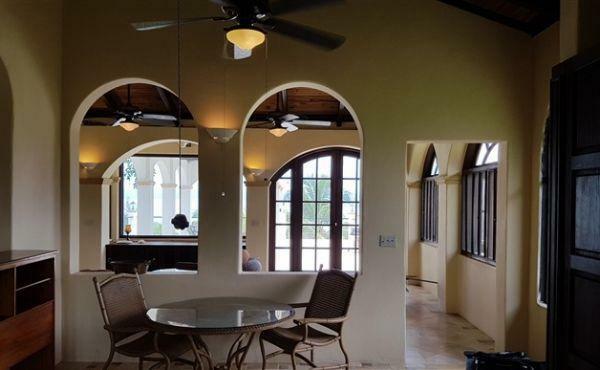 With over 4000 square feet of covered area, this large 4 bedrooms, 3 1/2 bathrooms main house was built for living in a tropical climate. 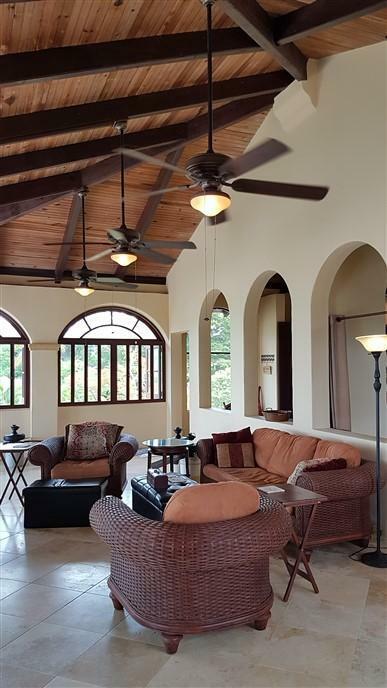 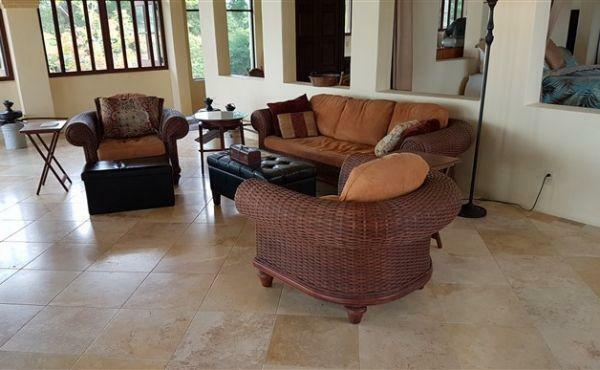 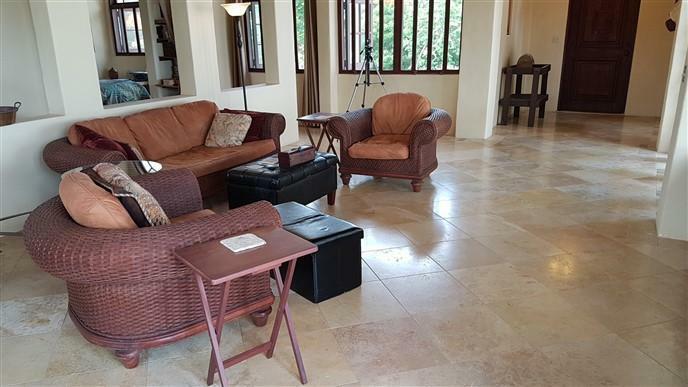 The indoor living area is simply but elegantly furnished with the emphasis on the ocean view. 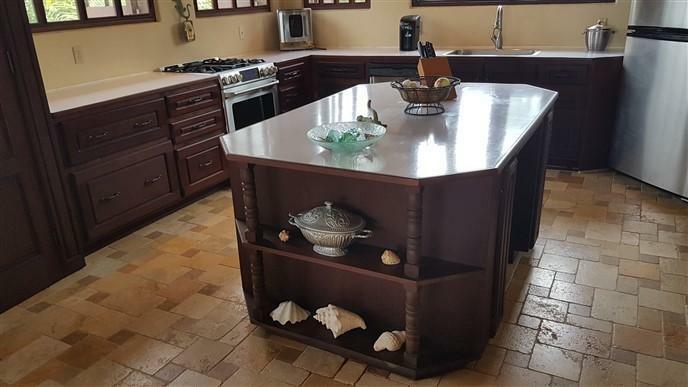 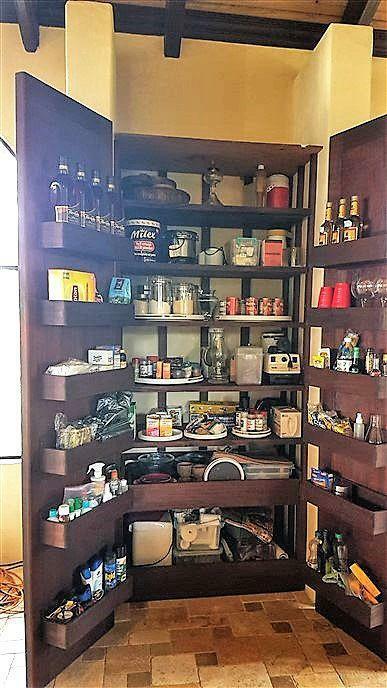 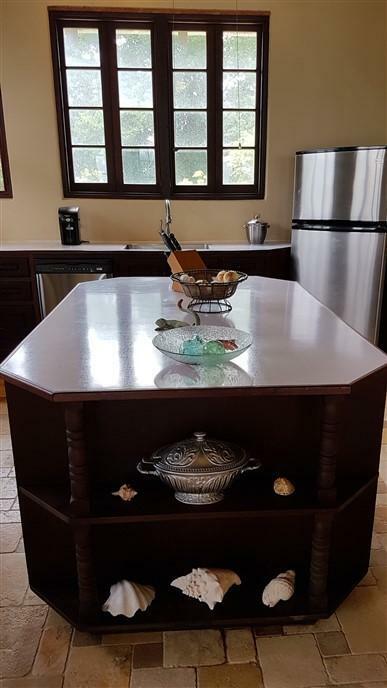 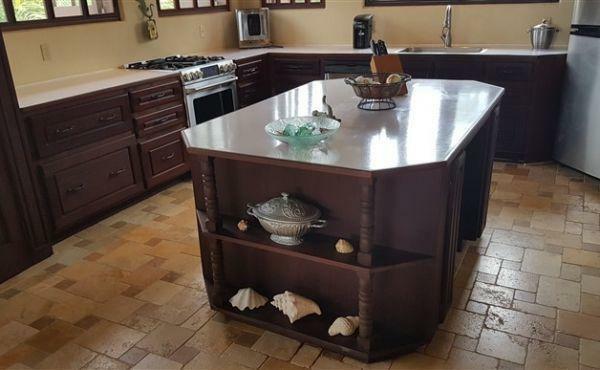 The kitchen is a gourmet delight featuring a huge 6' by 4' center island for meal prep and entertaining guests. 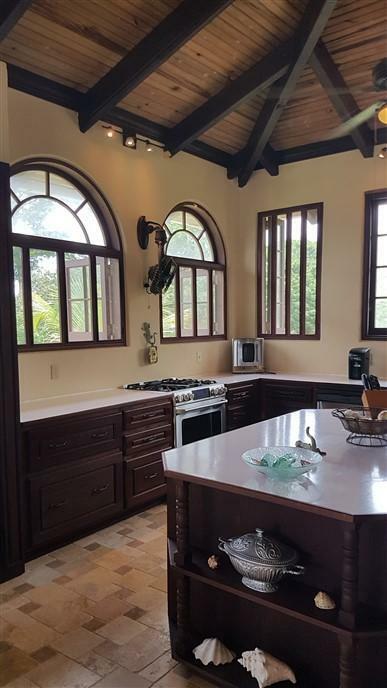 Custom Honduran mahogany cabinetry keeps everything stored out of sight, allowing the ocean view from the upper window walls of the kitchen to be the focal point. 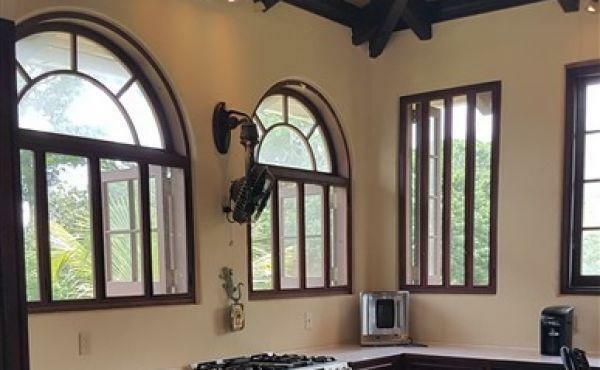 Windows and doors are custom made from Honduran mahogany with solid bronze hardware to eliminate corrosion from coastal environment. 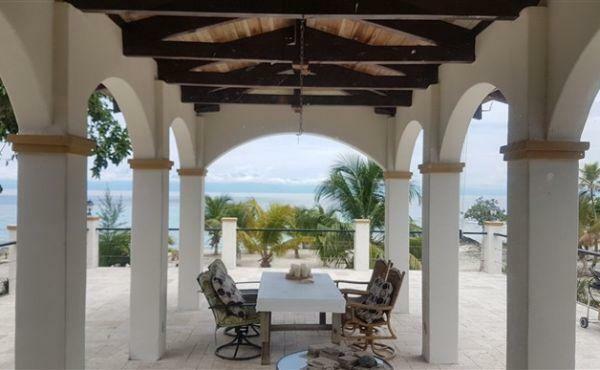 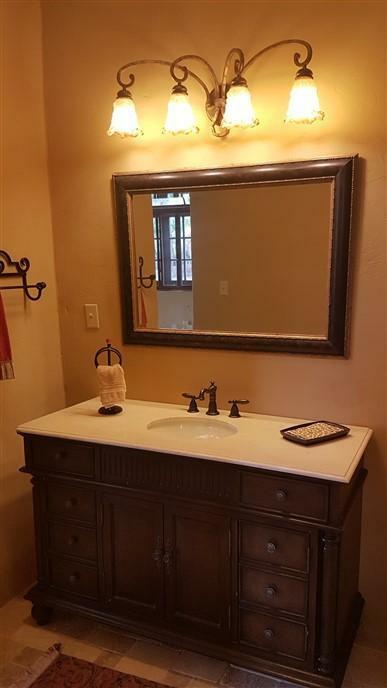 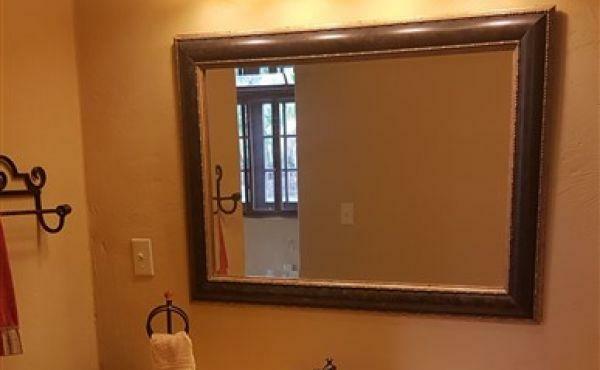 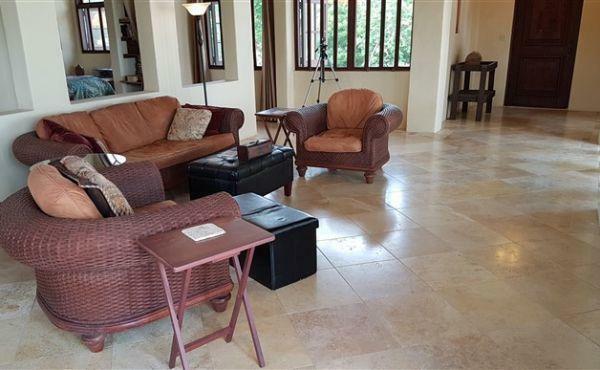 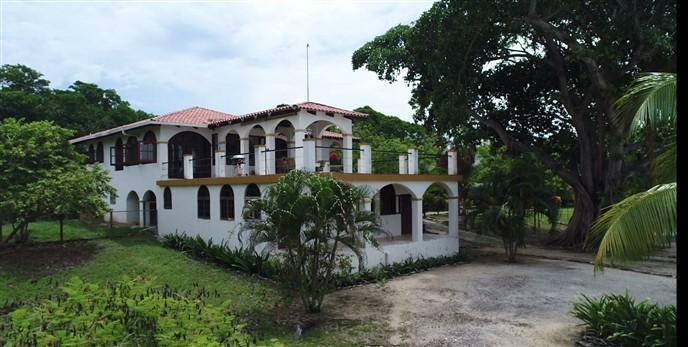 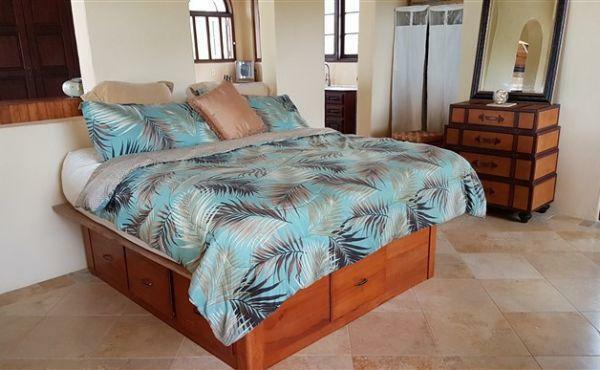 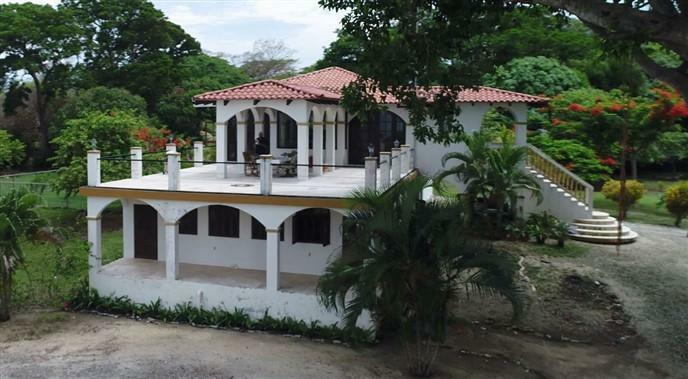 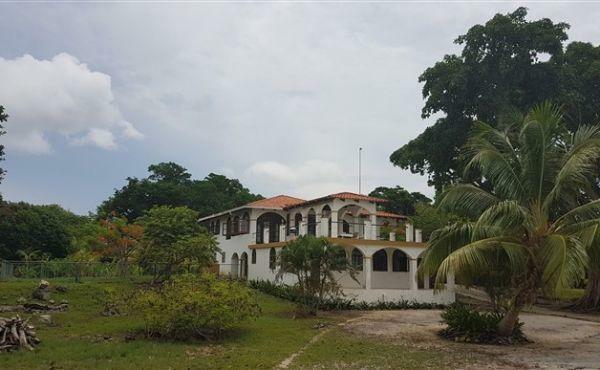 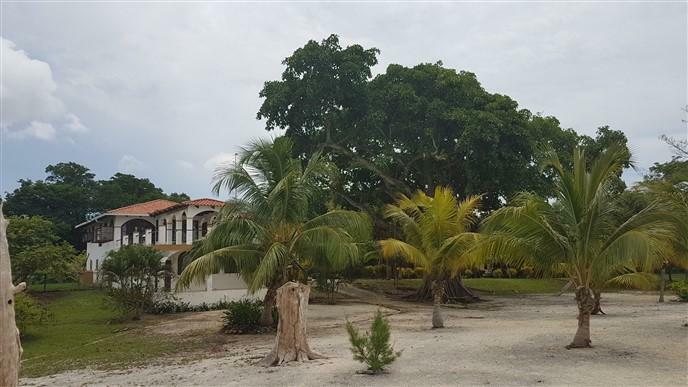 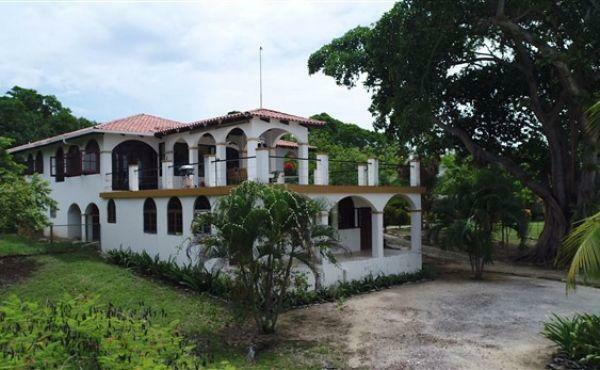 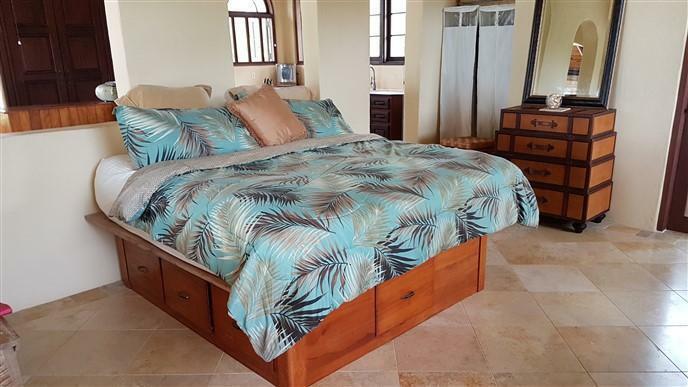 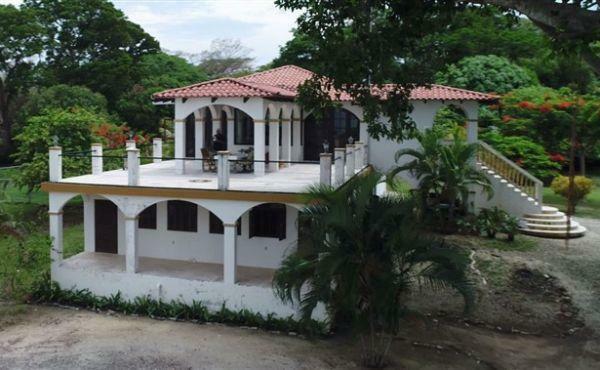 If you are looking for a one of a kind, classic, elegant ocean front home, Los Arcos is it! 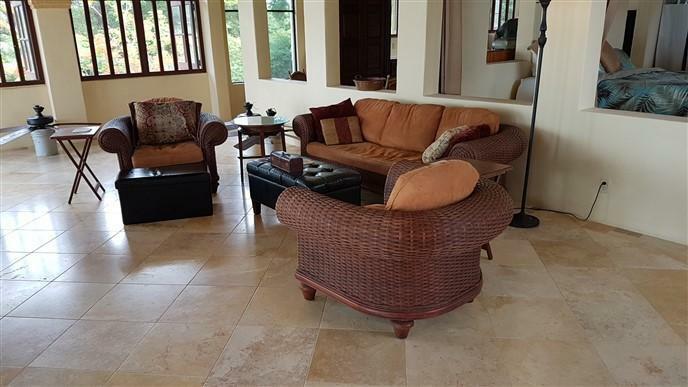 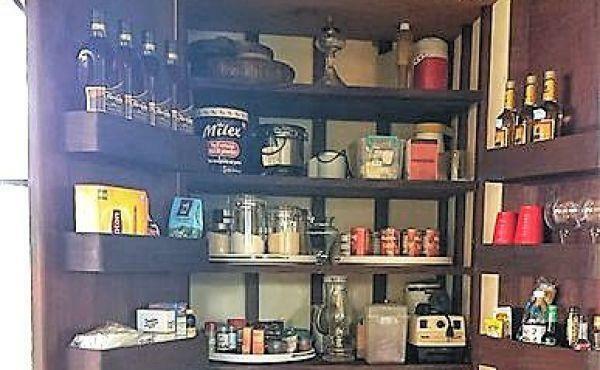 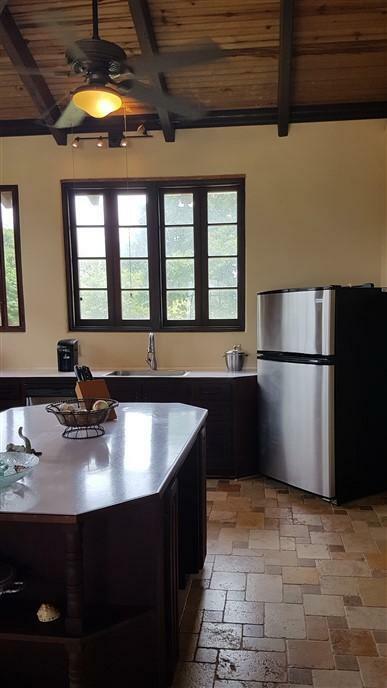 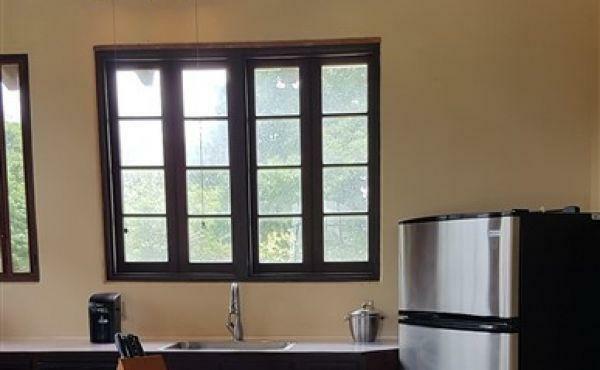 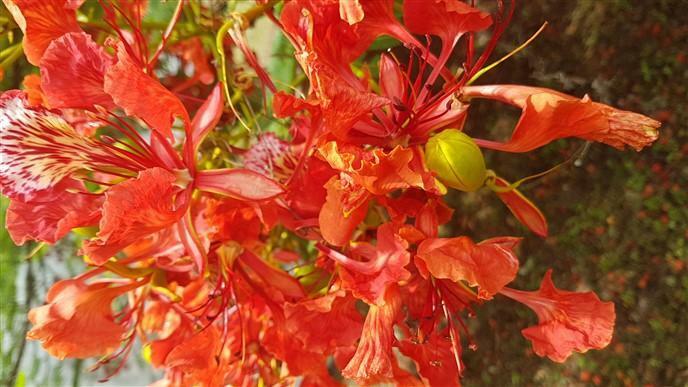 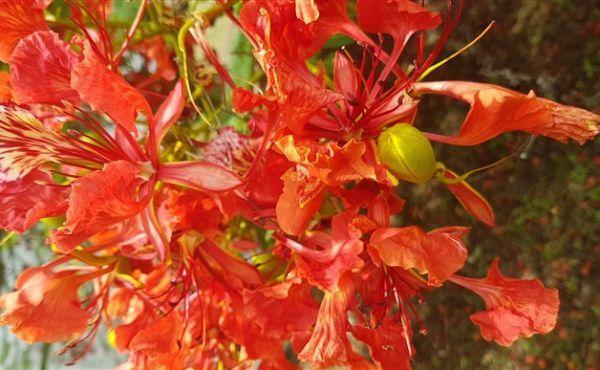 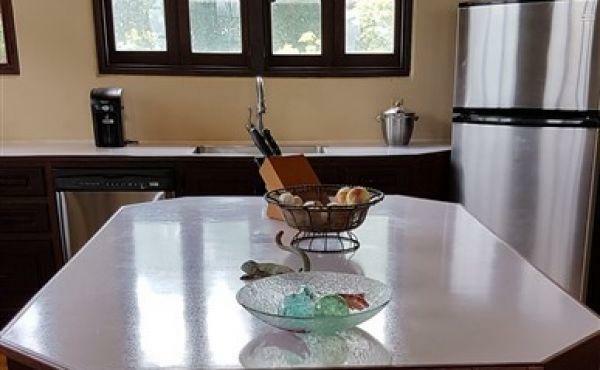 The property also includes a 2 bedroom,1 bath guesthouse and a caretaker's cottage. 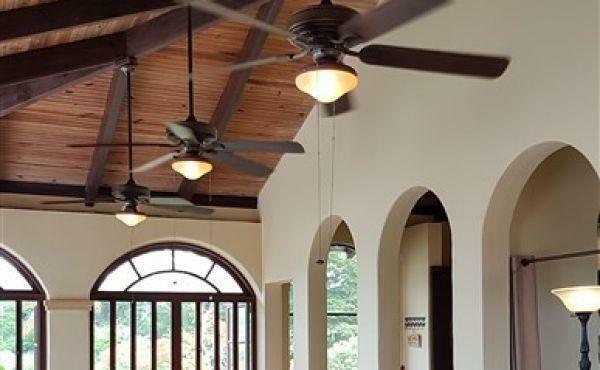 Should you desire there is ample room to add more buildings. 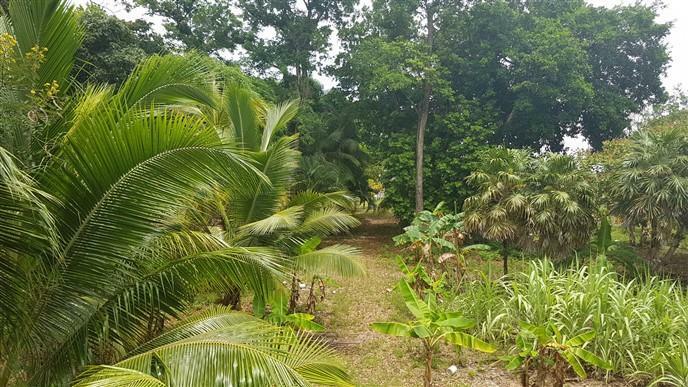 Mere steps from the main house you can enter the water at Jack Neil Bight. 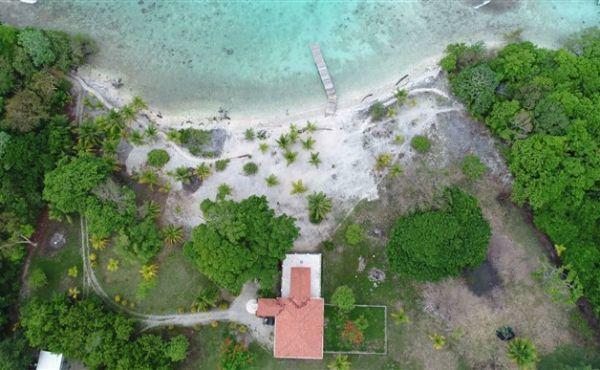 Here you'll find a wide range of Caribbean reef fish, from grunts to groupers, damselfish, spotted drums, pufferfish, trunkfish, seahorses, and turtles, eagle rays and moray eels. 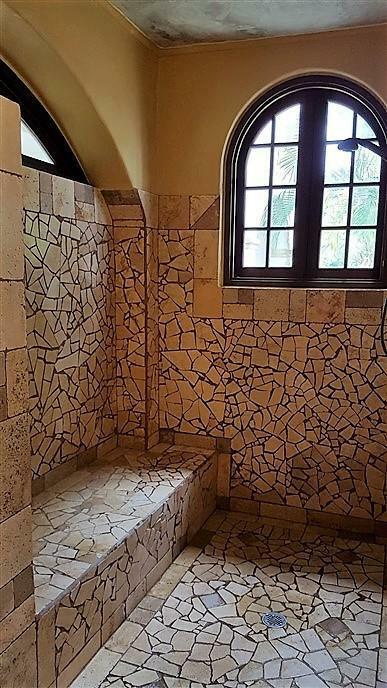 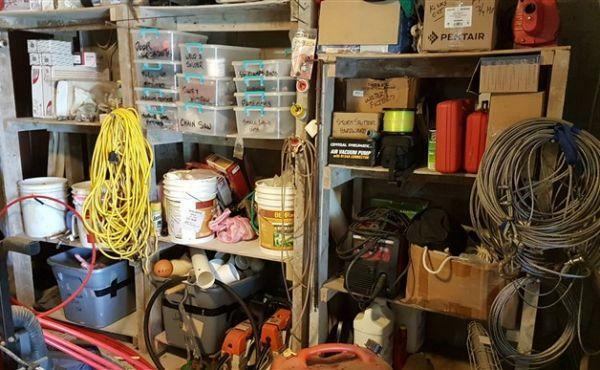 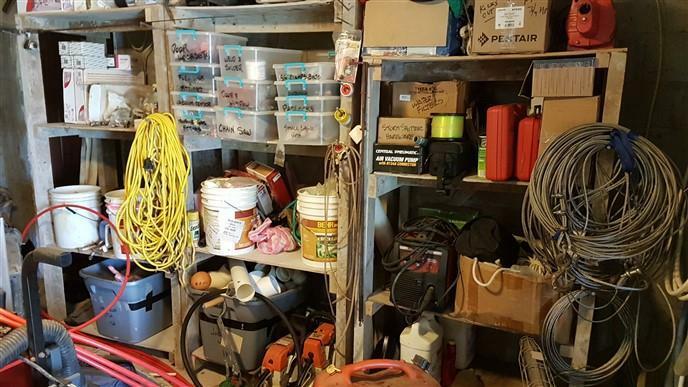 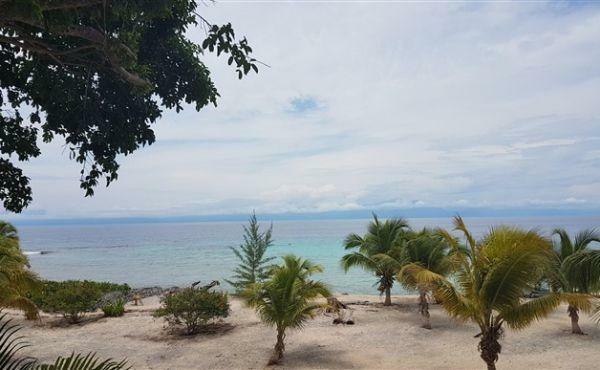 Perfect for shore diving and snorkeling! 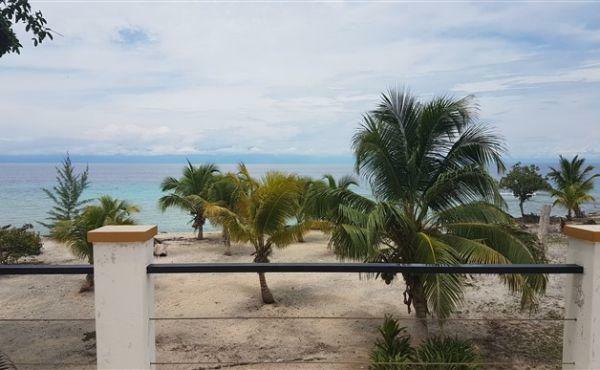 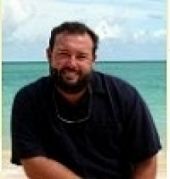 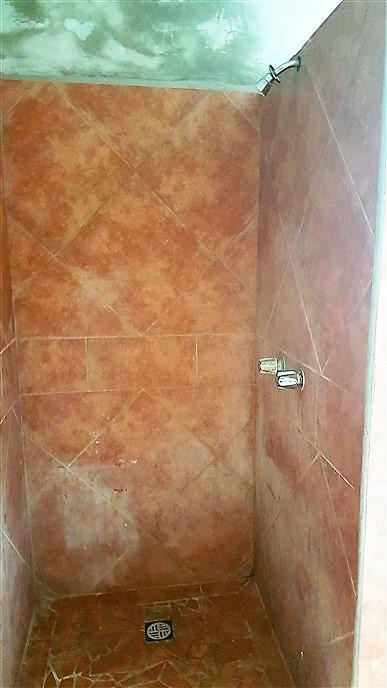 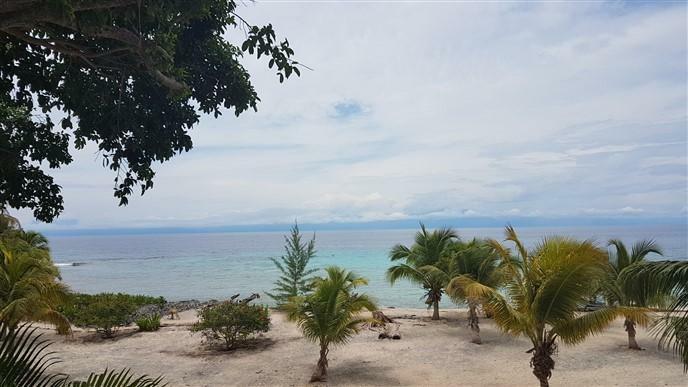 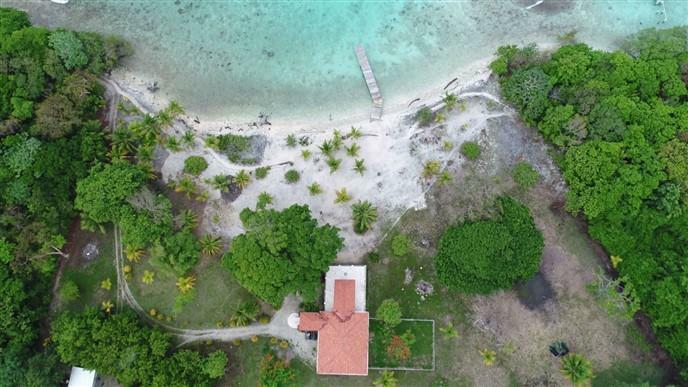 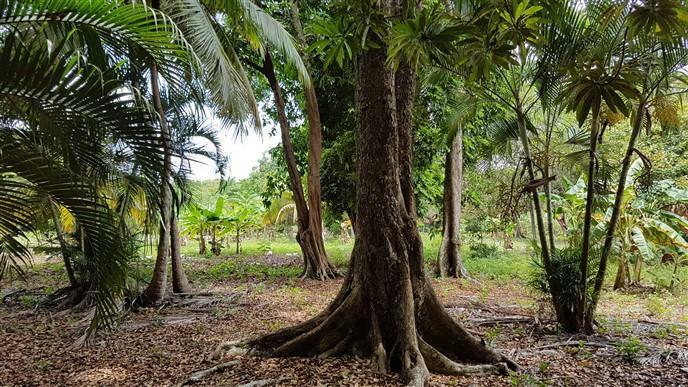 At Los Arcos access to public areas of South Shore and Utila town is hassle-free. 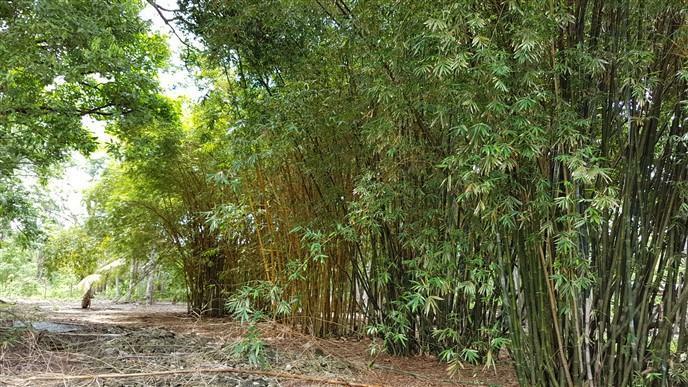 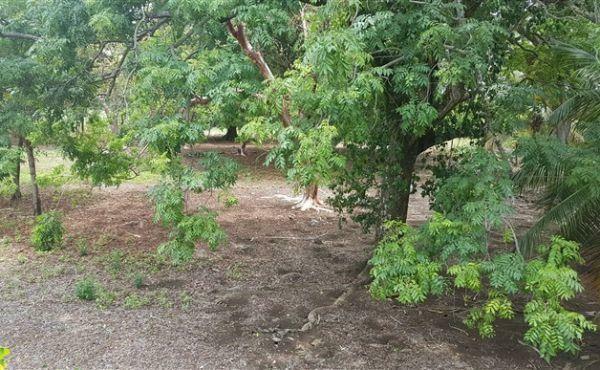 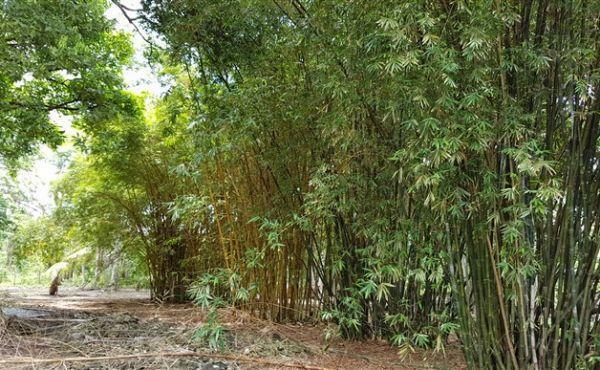 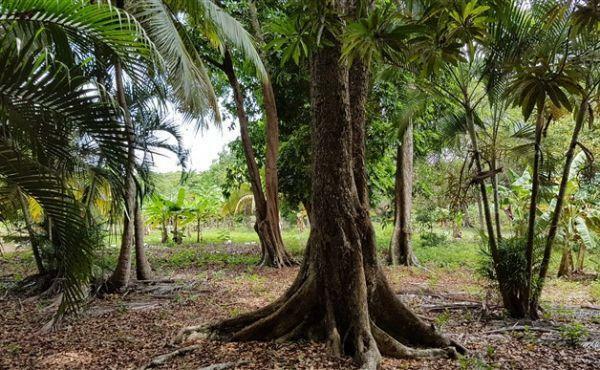 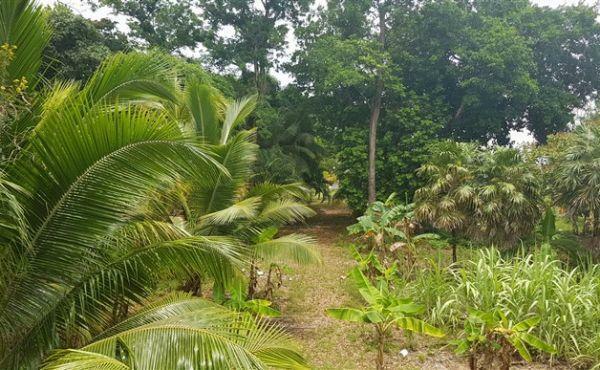 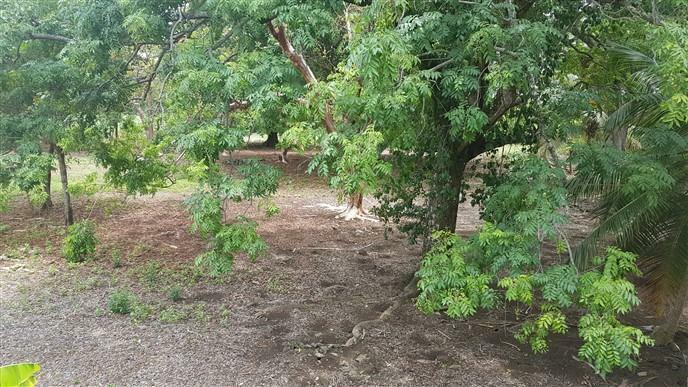 The access road that runs behind the property leads to Neptune's at Coral Beach Village and to the marinas at Oyster Bed Lagoon. 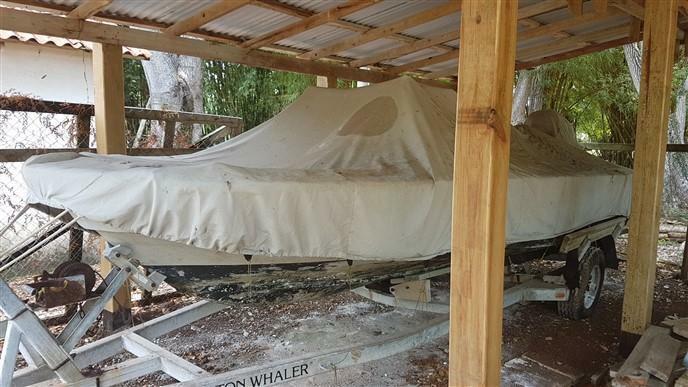 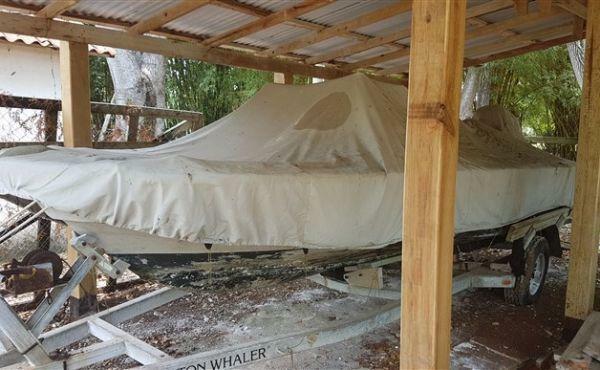 A 20' Boston Whaler boat and Yamaha 150hp, 4-stroke motor are included along with a private dock and on-shore boat shed.